Last time we left this book, Daredevil was being hunted by henchmen working for Mr. Slaughter, who in turn was working for Bullseye. All these guys just want Daredevil dead and I don't know why. He's got that snazzy red outfit and those fancy sticks. I don't know, maybe they're just crazy. 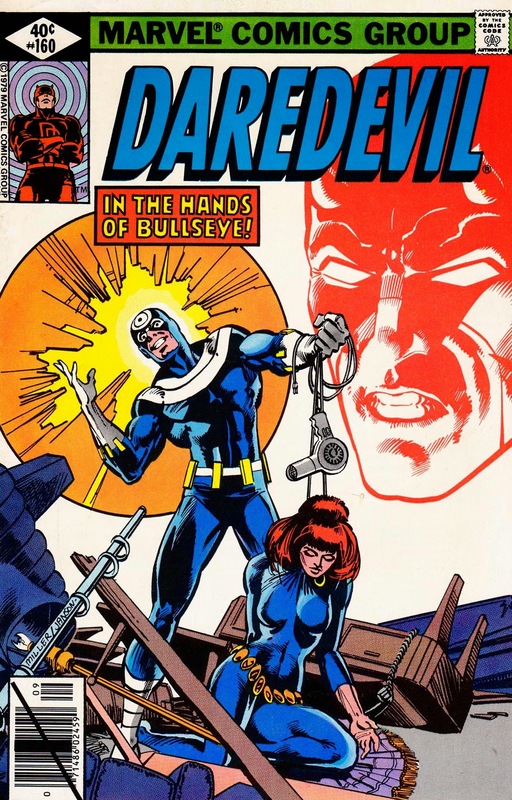 But know, before we even open this book, we see Bullseye holding the Black Widow, Horn Head's current love interest, hostage. Could this be a way to get the Devil to come to him? Of COURSE it is, without that we wouldn't have this comic book! Now, let's get all up in these pages and see what the marksman does with the Black Widow. We start this book following the Black Widow. She's just coming home from a night out, probably fighting crime or doing what ex-Russian spies do, and she's attacked by Bullseye! They have a real brutal fight, both getting some real good hits in on each other. Everything from elbows to vases get smashed on someone in this apartment, but it ends when Bullseye knocks the chandelier off the ceiling, bringing it down right onto Natasha, knocking her out. He leaves a picture of her with a bullseye painted right on it on the wall and he makes his escape. The issue now really starts and Matt Murdock is at a cemetery with Heather...Matt's current love interest? Yo, is Matt getting jiggy with two women at the same time as two different people?! I see you Matty, I see you! It doesn't go over well, when she asks him to stop being Daredevil and he doesn't give her a real answer. Foggy and his secretaries leave him alone with his thoughts for the day. But being home alone doesn't do anything for Matt but eat him up inside, might as well hit the streets and see if there's anything to do tonight. He makes his first stop at the apartment of Natasha Romanoff, or better known to all you kids who didn't know her until Iron Man 2, the Black Widow. He immediately senses something isn't right, as he smells blood and can sense all the damage. He finds the picture that Bullseye left for him and heads to the one man who's more investigative than him to find the answers he needs, Ben Urich, reporter for the Daily Bugle. He gives Daredevil all the info he's got on Bullseye and who may know where to find him, and just like that, Matt heads off into the night. He ends up at a dive bar filled to the brim with thugs and low lifes to get some answers. Naturally, they don't take too kindly to a stranger in a hat and trench coat coming in and looking for all the wrong answers. So a fight breaks out, because that's what happens at dive bars. Just when the thugs think it can't get any worse, the lights go out. Now Matt can take off his disguise and reveal that it was actually Daredevil looking for Bullseye. He gets the upper hand on every thug but leaves one able to walk. He grabs him by the collar and instructs him to go back to Bullseye and tell him, the Devil is coming for him. Some people say that Moon Knight is the Batman of Marvel comics, I don't really read too much Moon Knight...or any Moon Knight for that matter but I definitely think I'd give that title to Daredevil. To be honest, I'm probably getting that vibe because these issues were illustrated and eventually written by the man that would go on to pen and draw the masterpiece that was The Dark Knight Returns only about 7 years later. We can see that this man's style has stayed with him long passed this single title, and we're not even one third of the way through. I'm anxious to get to the issues were Miller takes over the writing duties, that's where we're really see some dark, gripping Daredevil stories. Until then, stick around for the ride folks!